At age 22, young adults with disabilities “age out” of the educational system. This can be a disorienting and dis-empowering event that alters their routine, isolates them from friends and mentors, and leaves them without a daily purpose and place to be. Though finding and securing employment can often be very difficult, and we hope that for our students, the Ready to Work! concept will help to change that scenario, showing that each has the capacity to be contributing members of society. A classroom based curriculum teaching “soft skills” needed to be successful in the workplace. From simply clocking in and wearing a uniform, how to work as a team, having appropriate behavior, being flexible, having a positive attitude, etc. Students complete a resume, learn and practice interview skills and come out far “readier to work”. 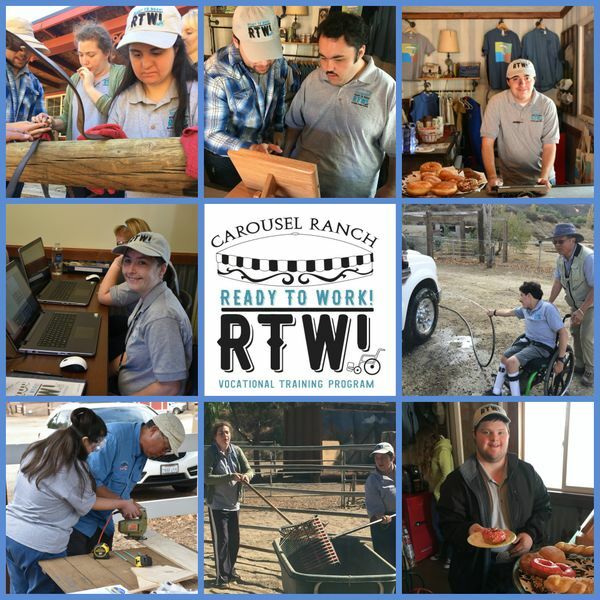 Classroom curriculum is then brought to life through actual work in the “Tack Shack/Snack Shack” social enterprise, run by the students, as well as various jobs around the ranch. By the time that our students leave here, they have done a variety of work – from horse and ranch care to vehicle washing, construction to office work, retail, food service, cashiering and so much more. Continued Growth—The program began with a pilot in June, 2016 and to date, 28 students have participated. The Community is Embracing RTW! — We are already seeing our RTW! students being successful in the community. Two have actually found paid employment, others are volunteering and businesses within our community are starting to offer work experiences for those enrolled. Recently two of our students had the opportunity to shadow waiters at a local restaurant for an evening (Wolf Creek Restaurant and Brewery). Another two will be spending a day at our local Mission Valley Bank, learning what it takes to work in the banking world. We want to see our students out volunteering and working in the community and see this as an area of real growth as we move forward! A look to the future —As we move forward…we have so many hopes and dreams for RTW! Expansion…serving more individuals…job and volunteer placement in the community and the creation of our new “Ready to Grow!” – Carousel Farms – where students will plant, care for, harvest and sell produce, herbs and even pumpkins that they grow here on site.